Originally posted at G4@Syfygames, 12/12/2015. The blending of flavors is a very finicky science. Too much of one taste and too little of another, and the end result can be unpalatable, or worse, downright inedible. Then again, hitting that magic ratio between flavors can create a golden synchronicity, a fusion that is more than the sum of its parts. Video games are no different once they begin attempting to blend genres and elements in order to create something new. Sublevel Zero is one of those games, and while it does create something interesting, certain elements overshadow others, and the package suffers as a result. However, that’s not to say that the end result isn’t tasty — for all of its pacing problems and strange issues due to its visual design, the game is still a metric ton of fun. If you’ve ever played the classic PC shooter Descent — which, by the way, is one of my favorite games of all time — you’ll feel right at home playing Sublevel Zero. For starters, Sublevel Zero will require a significant acclimatory period for those unfamiliar with first-person perspective games that give you unlimited access to three-hundred-and-sixty degrees of motion. It’s as if you’re playing a corridor shooter and a flight sim all at once, and learning how to do that well is like learning how to ride a bike and snowboard at the same time. In order to know how to target enemies, remain aware of where fire is originating from, precisely where you are at any given moment and what movement / evasion options you still possess in limited quarters, you’ll need two different skillsets working not only in tandem, but harmony. Furthermore, it’s a constant, everpresent thing that very rarely lets up on the pressure or the intensity of it. What this game does to set itself apart from its spiritual predecessors is add an element of crafting to the mix, and while I can appreciate the ability to make better weaponry and gear, it felt unnecessary. I would have much rather focused on surviving the madness during the descent (ayyyy) through the increasingly-difficult sublevels, instead of focusing on grinding for better loot, which feels like a very cheap way of forcibly extending playability. It could stand to just drop the crafting system entirely for a large roster of random-drop, static-stat weapons and the game would have likely been leaner — and thus stronger — as a result. It nails the claustriphobic feeling that the Descent games were known for, but its color palette is one of light bloom and neon. You know that feeling you get when you see a movie early in the day, then you step out of the dark theater into the sunlight after the movie ends, and your eyes feel like everything is overexposed? Imagine that feeling, plus Far Cry: Blood Dragon, plus pixel-art aesthetic, all the time. It’s a cool look, but it feels…overdone. 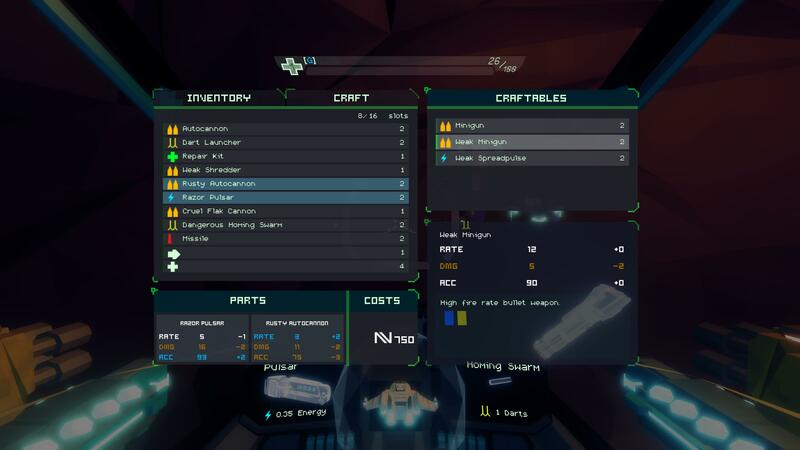 It causes ocular weariness very quickly, and when combined with the roguelike nature of the game — procedurally generated levels, scarcity of health packs, the need to grind for better equipment in order to survive — Sublevel Zero is best played in short bursts, rather than marathon sessions. Any more than that has got to be bad for you. I know I seem harsh in my criticism, but let me say this: the game is still a blast to play. 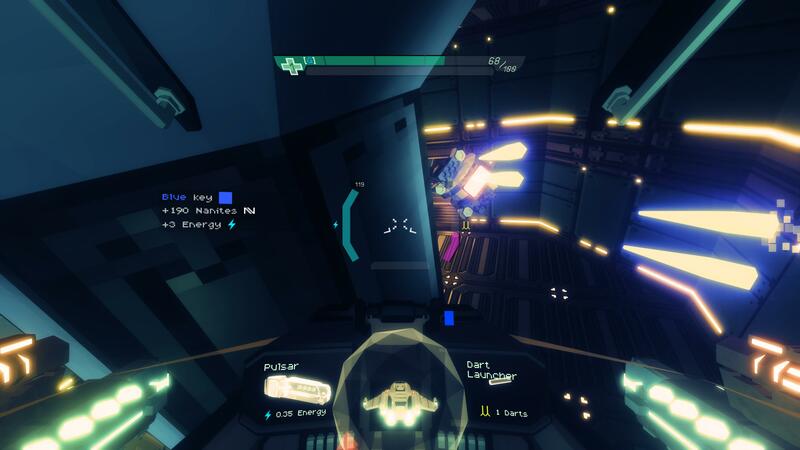 If you’ve ever loved a six-degrees-of-freedom shooter in the vein of Descent or Freespace, you’ll adore Sublevel Zero. Just be aware that the package is rather flat when you get down to brass tacks. 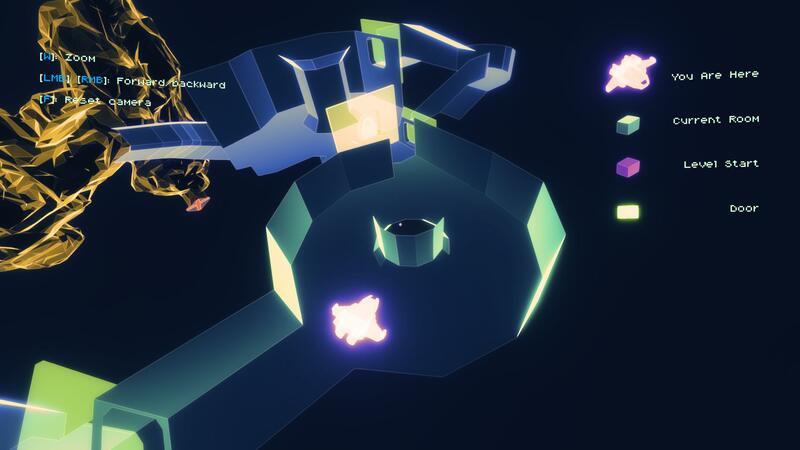 The level variance doesn’t really “feel” different, it’s procedurally-generated, sure, but it’s not like you get anything except small room-big room-corridor-big room-corridor-small room motifs. It’s repetitive in the worst sort of way, and that hurts to say, because the gameplay is actually quite fun when you’re 1.) not frantically searching for a health pack, 2.) wondering why you can’t get better guns, and 3.) dodging the light bloom blinding you at literally every single turn. Still, the game is a lot of fun, and it’s worth recommending to anyone who wants a throwback to a bygone era. The only problem is, they’ll have to stomach a very odd flavor combination that doesn’t taste quite right. A little more attention to the finer details and balance of this game, and it would have been something brilliant. As it stands, it’s just going to have to settle for “pretty good.” At $15, “pretty good” may not be good enough for some. This game’s review copy was a digital download code provided by the publisher. A fantastic idea that can’t quite capitalize on its concept. 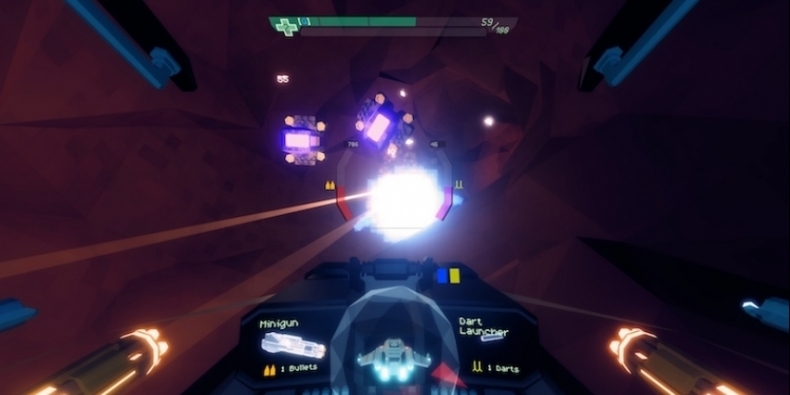 Sublevel Zero is a fun game. Don’t get me wrong, it’s not bad by any stretch of the imagination, so don’t look at this score and think “it’s bad.” It is most certainly not. However, it’s not tuned as well as it could be, and just like that dish that needs a slight pinch of salt and a lemon wedge’s worth of juice to complete it, you’d swear it was “missing something” without it.